Hammers fans will have little difficulty in recalling our former left back Herita Ilunga - a committed and passionate performer known for his robust tackling as well as his frequent forays down the left wing. In all, the Congolese star spent over three years at the Boleyn before returning to France where he is still active. 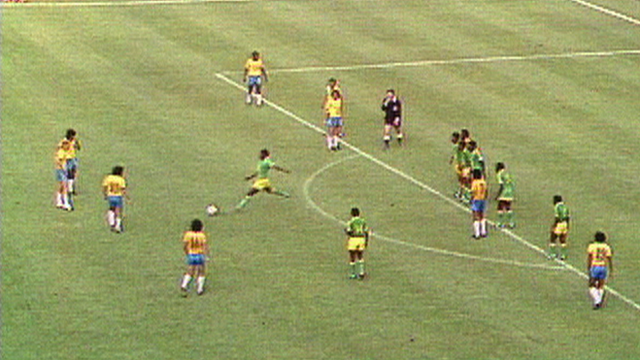 However, Herita's efforts are forever to remain mundane compared with those of his namesake, also from the Democratic Republic of Congo, Mwepu Ilunga - the player responsible for one of the World Cup's weirdest moments. in 1974, he was selected at right back for the then Zaire (now DR Congo) national side that competed in the finals which were held in Germany. Asa buoyant Brazil, already 3-0 up and cruising, prepared to take a free kick - the bold Mwepu ran out from the wall and thumped the ball upfield to apparent safety. Go for it, my son! As much of the World either cringed or broke down in laughter, the referee punished Ilunga with a yellow card (yes folks - it was hard to get sent off back then!). As the story unfolded - Ilunga explained that he was acting in protest at the treatment he and his squadmates received from the National government and actually wished to get sent off! The rule of sartorially elegant but morally-corrupt dictator Joseph mobutu continued for Zaire until 1997 when he was forced to flee and the country reverted to the Congo as it's name. Unfortunately, they have had little subsequent footballing success asstandards have risen in African football. Never the less, Ilunga will always be remembered for his remarkable contribution to footballing history! did anybody ever bring it up with Herita during his time at West Ham. Is he a national hero? Where did ilunga go after Doncaster? Lampard: We can still win the World cup! Sam: Campbell Can Be Our New Wanchope!